The district is sending this notification again as the Tioga County Public Health Department has seen multiple cases of Pertussis, also known as Whooping Cough, in the past few weeks. It was brought to our attention that confirmed cases of pertussis (whooping cough) have been reported in our district. We have been working closely with the Tioga County Public Health Department and the New York State Department of Health to ensure that we are appropriately addressing this issue. "Tioga County Public Health has seen multiple cases of Pertussis, also known as Whooping Cough, in the past few weeks. 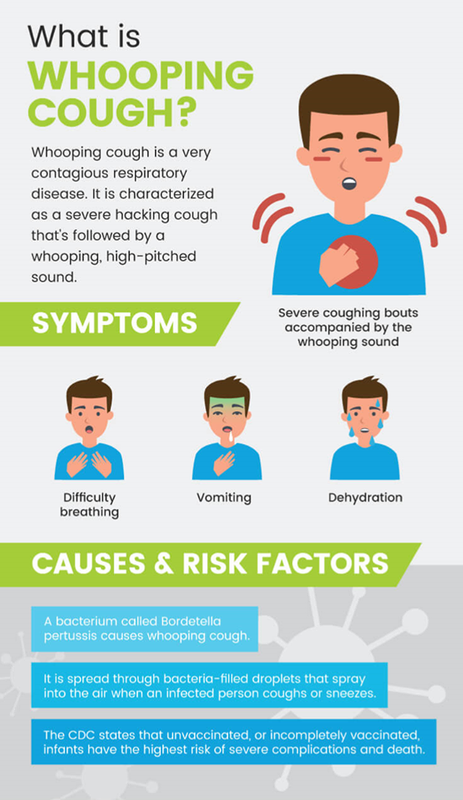 Whooping Cough is a highly contagious respiratory disease. Individuals are urged to contact their health care provider if they or someone in their household have experienced rapid coughs followed by a high-pitched “whoop” sound, vomiting during or after coughing fits, or exhaustion after coughing fits. Please contact your health care provider if you have experienced any of these symptoms and avoid close contact with others. Make sure that you and your family are vaccinated against Pertussis. You can also protect yourself by washing your hands often, avoiding close contact with others who are sick, and making sure you do not share cups or water bottles with anyone, including friends or family members. If you have further questions please call your health care provider or one of our Public Health Nurses at 607-687-8600. For more information, please visit https://www.cdc.gov/pertussis/."